Can an old drug help prevent suicide? 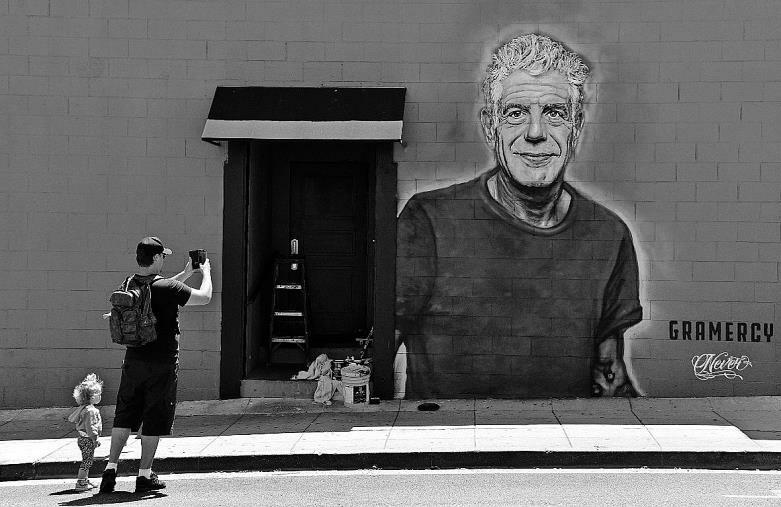 Chris Pizzello/Invision A fan takes a photo of a new mural of the late chef and TV personality Anthony Bourdain on the side of a Santa Monica, Calif., restaurant. Bourdain died June 8 in France. Celebrity suicides make headlines. That is largely because the public is shocked that someone who is rich, successful and admired by millions of people would take his own life. But major depression can strike anyone — rich people or poor people, stars or unknowns, teenagers or senior citizens. We’re often disappointed by the publicity that surrounds high-profile suicides. The morbid curiosity and sensational coverage by the media appear to trigger more suicides. A study published in the journal PLOS One (Feb. 7, 2018) notes that the suicide rate went up 10 percent in the four months following the suicide of Robin Williams. The advice that frequently accompanies such tragic events also is unsatisfying. People are urged to seek help if they have suicidal thoughts. That seemingly makes sense on the surface, but mental health resources are stretched. There is an increasing shortage of psychiatrists in the United States. Mental health resources have been underfunded for years. According to the American Psychiatric Association: “The number of psychiatric hospital beds in the U.S. has dropped significantly in the past several decades — more than 96 percent since the 1950s and more than 17 percent just since 2010.” That means that people with major depression may end up waiting for days in an emergency room before a bed becomes available. Even when patients in crisis finally get professional care, the available options are limited. Antidepressant medications can take several weeks to start working. Someone who is suicidal may not be able to wait that long. Drugs like citalopram (Celexa), fluoxetine (Prozac) and sertraline (Zoloft) don’t work for everyone. (Journal of Psychiatric Research, November 2014). A review of the medical literature notes that a single subanesthetic dose of ketamine “is associated with antisuicidal benefits that emerge within an hour of administration and persist for up to a week” (Journal of Clinical Psychiatry, March- April 2018). This suggests that if people could get access to the medication when they need it, it might save lives, especially if drug treatment is part of a comprehensive support program. In a new twist, a slightly different form of this old injectable medication is being developed. Esketamine will be administered as a nasal spray. Preliminary studies are encouraging. Until the Food and Drug Administration decides whether to approve esketamine, severely depressed people will need better treatment. If the experience following Williams’ death is an indicator, mental health facilities will be strained during the coming months. There is growing interest in an old drug that offers promise of fast-onset antidepressant action: an injectable anesthetic called ketamine.